Brian Burke, President and General Manager of the Toronto Maple Leafs, announced Sunday that Dave Farrish has been appointed an assistant coach on Randy Carlyle’s staff. Farrish joins Scott Gordon and Greg Cronin as Carlyle’s assistants. Farrish, 55, brings over 21 years of coaching experience to the Leafs’ bench. 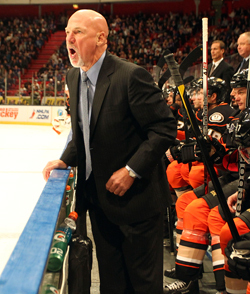 He most recently served as an assistant coach under Carlyle with the Anaheim Ducks for seven seasons (August 5, 2005 to December 1, 2011) and won his first Stanley Cup with the club in 2007. A native of Lucknow, Ontario, Farrish has served as head coach of 1,027 professional hockey games between the American Hockey League, International Hockey League and the ECHL, compiling a record of 520-402-83-22. He spent one season with the Pensacola Ice Pilots of the ECHL (2004-05), toiling as head coach and Vice President of Hockey Operations and leading the club to the league’s best record (51-16-5; .743 winning percentage). Before joining Pensacola, he led the Louisiana IceGators (ECHL) to four consecutive division championships from 2000-01 to 2003-04 with a 186-78-24 record (.687 winning percentage). After guiding the IceGators to a 56-12-4 record in 2001-02, Farrish was named ECHL Coach of the Year. Prior to his time in the ECHL, Farrish was the head coach of the AHL’s Springfield Falcons from 1997-98 to 1999-00, compiling a record of 113-96-27. From 1993-94 to 1996-97, he served as a head coach in the IHL with the Salt Lake City Golden Eagles (1993-94) and Fort Wayne Komets (1995-96 and 1996-97). His coaching career began with Moncton of the AHL in 1989-90, where he was also head coach until joining the New Jersey Devils as an assistant coach under Herb Brooks for the 1992-93 season. Including the Devils, Farrish’s teams have qualified for postseason play in 17 of his 21 seasons. Farrish played seven seasons (1976-77 to 1983-84) in the NHL as a defenseman with Toronto, Quebec and the New York Rangers. In 430 regular season games, he recorded 127 points (17 goals, 110 assists). As a Leaf, Farrish posted 11 goals, 69 assists, 80 points and 215 penalty minutes in 209 games. He was originally drafted by the Rangers in the second round, 24th overall, in the 1976 NHL Entry Draft.